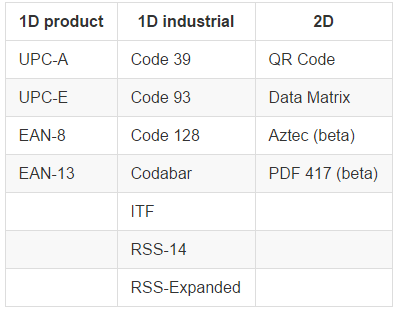 Kiosk Browser uses the ZXing barcode scanning library which is an open source software suite for reading bar codes from various sources. It is licensed under the Apache License v2.0. If you are using a barcode scanning device such as a Zebra TC series, please see Zebra TC Series Integration (Barcode Scanner) for device specific information. There are multiple ways to use the barcode scanner. We have worked with the creators of a barcode scanning keyboard to provide a working solution to enable you to scan barcode data directly into input fields on any webpage, no coding required! 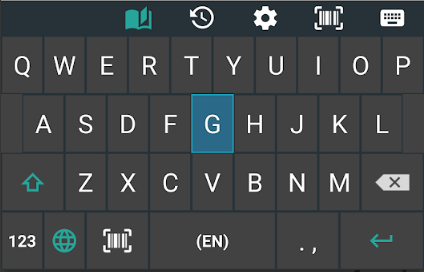 Just install the keyboard on the device and set it as the default input (this can be done by opening after installing). Once set you can tap into any input field and press the barcode scanner icon. Scan directly from the barcode scanner icon. To enable the icon go to Settings > Toolbar > tick Barcode Scanner. This method is essentially the same as above but allows additional data to be passed for the final result. In the example below you can see that "stockcheck.php?productcode=" is being passed as an additional parameter. This allows you more control over the resulting URL. If the Barcode Redirect URL is set to http://www.android-kiosk.com the resulting URL after scanning would be http://www.android-kiosk.com/stockcheck.php?productcode=9549548L.